Potstickers. Potstickers. Chinese dumplings. My favorite food, bar none, of all time. 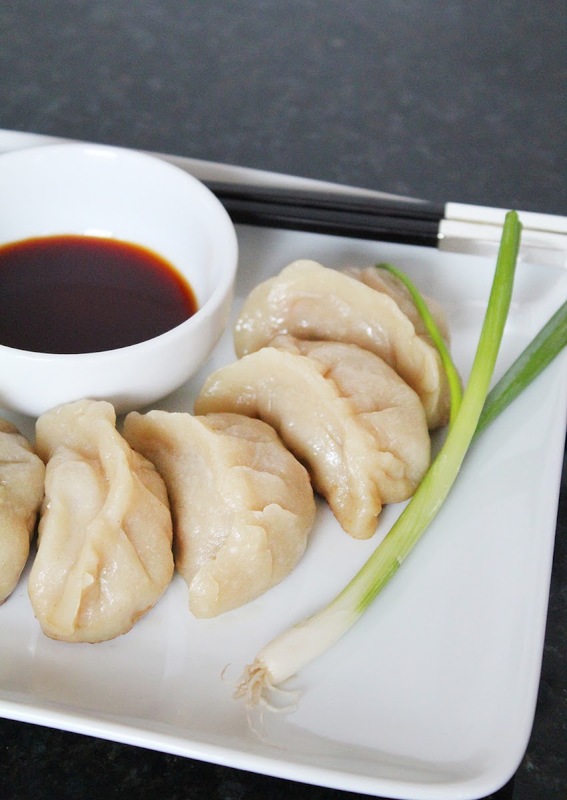 Growing up with a Chinese mother, potstickers (jiaozi) were served frequently. Jen loves them too but hates the mess so unfortunately today the kitchen is going to get a little messy while I show ya'll how to make these tasty treats. Just to be clear, we're making real potstickers here - traditional, juicy (read between the lines - fatty), pork-filled, fried potstickers. However, these can be easily steamed or boiled, and can filled with nearly anything you like, so try some different things out. 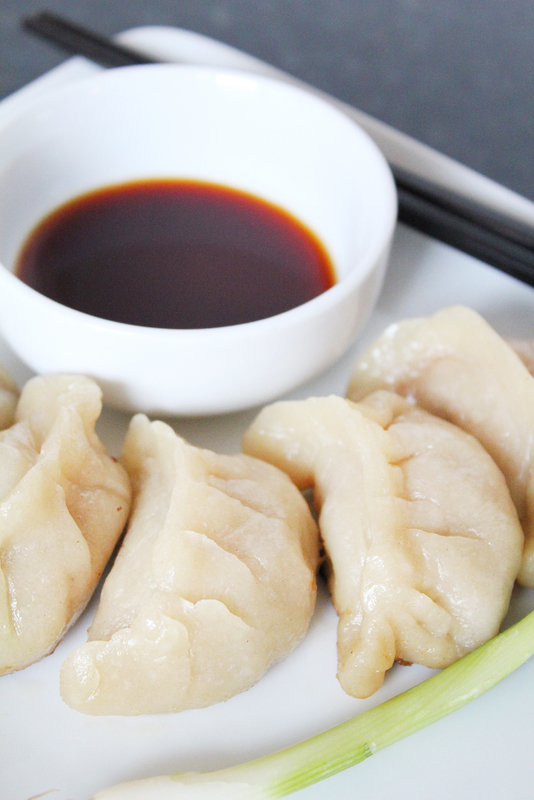 The key to good potstickers is the dough, which is both the easiest thing to make and the easiest to screw up. And it takes some elbow grease, so get ready. Download recipe card here. Mix the filling first. Blend the egg and put all ingredients together. In place of the cabbage, you can use almost any cruciferous or sprouted vegetable (in this one I used diced pea shoots for a little spiciness). Set aside covered with wrap in the refrigerator. 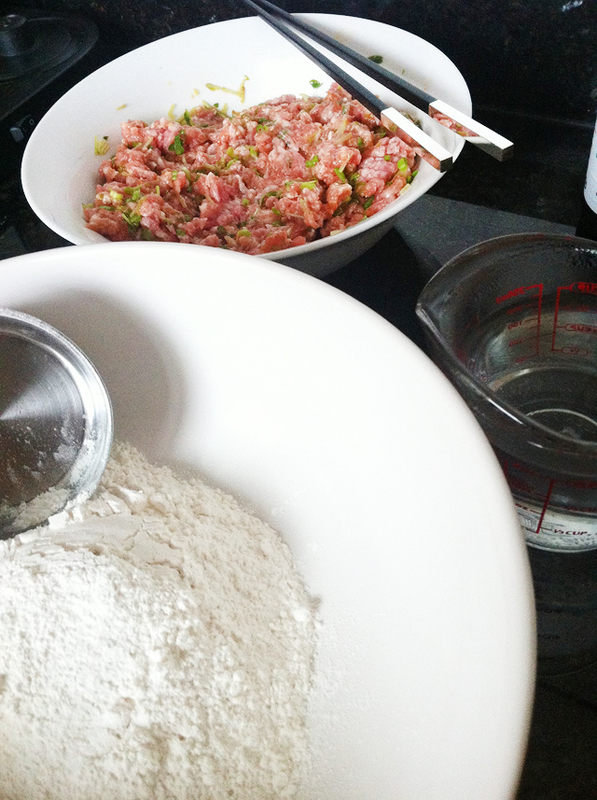 Mix the flour, water and salt in a bowl and knead until smooth - about 5 minutes. Add flour if the dough is too sticky but it can have a slight tackiness. Mold into an even ball. On a dusted surface, split the dough into 2 halves and roll them into 1" diameter tubes. Using a sharp knife, cut 1" segments and ball them. Keep dusting to prevent sticking. With each ball, flatten on the surface then use a pin to flatten the dough into 3" or 3 1/2" flats. Put 1 heaping teaspoon of mix into the center of the dough, fold over, then pleat one side, pressing into the other as you go. This is what creates the traditional crescent shape. In a hot skillet (over medium-high, and as always, I prefer cast iron). add 1 Tb oil and spread. 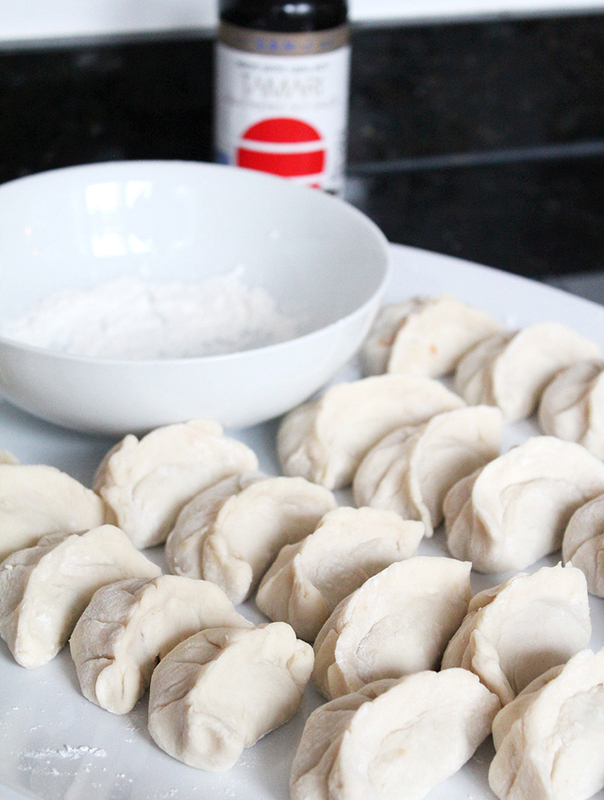 Place the flat side of the dumplings into the pan. After about 90-120 second, they will brown on that side (don't lift them until after they have had a chance to brown). Once they are golden brown, add 1/4 C water and cover. Cook for another 5 minutes, then remove and serve. The sauce you use is really to taste and you can use all kinds of them, but they are just as good plain. However, some of the simple sauce mixes that you might consider are: sesame oil with soy sauce, duck sauce (apricot) with soy sauce and chili flakes, or my favorite - cider vinegar with soy sauce (1 part each). Good potstickers take a bit of practice and patience but once you get the swing of it, they become easy and pretty quick to make. They freeze well and are good for at least 2 days in the fridge. Sorry, no such thing as too many. Seriously?! This is just too good! Love that you posted the homemade way to make these! wowzers! this is fantastic. i plan to attempt this... they're one of my fave foods, too! *bookmarked and PINNED! I think my husband will love these. Can you recommend some other cruciferous or sprouted veggies u use. Have you though about doing videos? Would be cool to watch you do the folding part. Jen has always tried to get me to do video so I may try at some point. Cruciferous vegetables - cabbages - work well for potstickers but they each have to be treated in their way. Napa cabbage is best - thinly sliced. Outside of that, bok choy, cresses and even kale work well, but may have to be blanched before using. 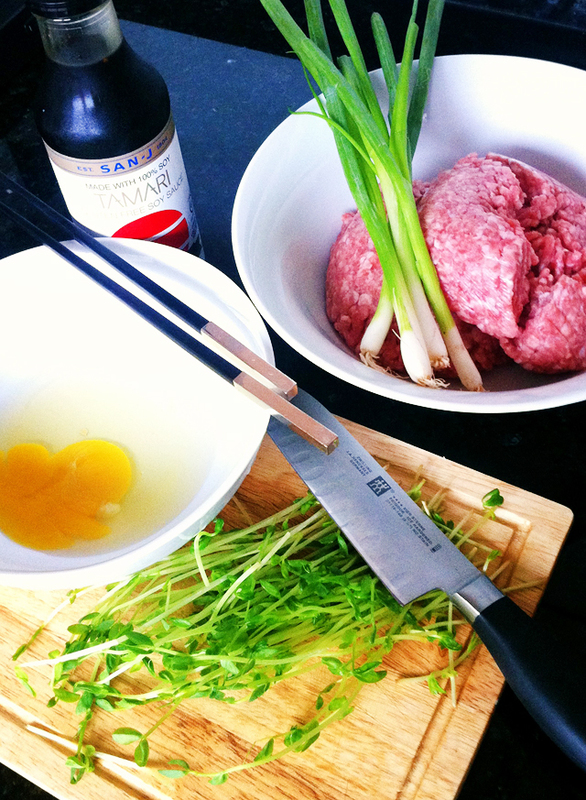 Also scallions, cilantro, mizuna or minced brussel sprouts can provide flavor. For sprouts use something hearty - pea shoots, bean sprouts and broccoli sprouts.